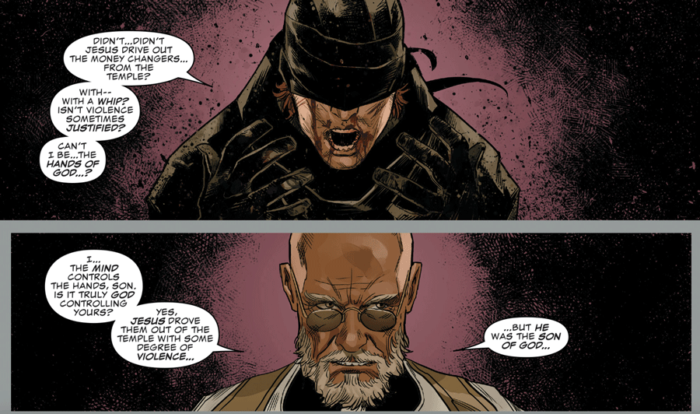 However, when I read the new Daredevil #1 today, I knew I couldn’t put off returning to the blog any longer. The Matt Murdock I love so much is back, you guys. In a big way. And the best possible way to get back to writing about Daredevil is to be so moved and excited by something that your myriad of thoughts on the subject can’t be contained. For this review, they will be mostly spoiler-free though. I’m actually going to start with the art this time around. It’s glorious. I’ve mentioned before how much I’ve loved Marco Checchetto’s take on Daredevil in the handful of issues he’s worked on over the years. The way he draws Matt lines up better with my inner picture of the character than probably any other artist. And his style incorporates just the right amount of detail and realism in its rendering of people and places without making the scenes too busy or hard to read. So, you can imagine my delight to see Checchetto back, and better than ever. I didn’t even think that was possible. The scene above that has him sitting on his bed with a shadow cast very deliberately across his face is divine (and I find great humor in seeing a New York apartment with that great of a view so completely wasted on its occupant). The panels showing Matt, as Daredevil, out on the town are dynamic and breathtakingly dizzying. Close-ups of faces show all the range of human emotion you could ask for, and appropriately underscores Matt’s vulnerability and complexity. Which brings us to Chip Zdarsky’s writing and the overall plot. Because this is what I’ve been missing for much too long: The opportunity to really get under Matt’s skin and into his head. This central idea that Daredevil is Matt Murdock, more than the other way around. That “Matt Murdock” isn’t merely some convenient secret identity, but a fully fleshed out, extremely complex human being with Daredevil as one of his guises. More “real” than his civilian self in some ways, less so in others. And, in no way complete without that part of him that is firmly planted in the real world. And in his own personal history. I’m sure there are probably one or two people out there who think revisiting Matt’s past, his boyhood, and his accident has been done enough times already. I don’t know who these people would be, and I’d bet they’re cold and dead on the inside, but I don’t doubt they exist. Because it’s not an uncommon well for writers to go to for inspiration. But there are often good reasons for it. Particularly when our main character is in a position to question not only his abilities, but his motivations as well. This issue has three flash-back scenes, perfectly sepia-toned by colorist Sonny Gho (who delivers a knock-out performance throughout), that together perfectly sum up the way Matt’s life has been shaped by both nature and circumstance. The first sees him dragged to church by his father to confess a crime committed with nothing but the best of intentions, and the second sees him confront an uncertain future, still not healed from his sight-stealing accident. The reader knows that those other gifts Matt’s priest speaks of will reveal themselves in time, but in this moment young Matt is left knowing only the loss and unable to imagine a way forward. The third time we see him is early in his “career” (above), in a scene visually similar to the esthetic of the television show, as well as the Man Without Fear graphic novel by Frank Miller and John Romita Jr. By now, nature and circumstance have come together in violent ways to create Daredevil. Or at least a younger version of him battling his violent impulses. These themes are echoed in the present. Following Matt’s near-fatal encounter with a truck at the end of the previous run, and his slow recovery during the Man Without Fear mini-series, he is yet again at an impasse. He picks up a woman in a bar while dabbling in crime-fighting, and neither activity seems motivated by anything deeper than something to do. Though still injured, he takes Daredevil out on the town, as much to make an appearance and state his presence, as in an attempt to stop crime. Even though the latter is so very much in his nature, and nothing Matt bothers hiding to himself. There’s talk of feeling trapped, during his recovery but also by simply existing within the confines of his apartment. In conversation with his one-night stand, he reveals that even his professional plans are on hold. Daredevil is the anti-dote. But is this way of living sustainable? That is a question Matt asks of himself, and it hangs in the air throughout the issue. Once more, he’s pinned between his nature and his current “futureless” circumstances. Again, it ends in what appears to be a most violent way with a cliff-hanger that will leave you wondering just how Matt is going to deal with what comes next. It’s brilliant. Of course, alongside Matt’s tale, we get glimpses of the current state of affairs in the police department, as well as the mayor’s office, that adds to the sense of entrapment that runs throughout this issue. It’s an elegant piece of world building that I’m sure will keep building to something very interesting. There is also a really good bonus story at the end of the issue that’s penciled by Chip Zdarsky himself, and that also deserves its own post. Having to write more than one to cover everything you loved about an issue, is exactly the kind of problem I want to keep having for what is hopefully years to come. Ever since I read that bonus story by Chip I’ve been wanting to hear your take! Oh you make me want to read it so badly now! I will try to buy it asap. The art looks so gorgeous, I’m already sold on this. Now what you say about the writing means I will enjoy it so much too, I trust your judgment. Can’t wait! I can give no higher praise than this. This is my favorite issue since Ed Brubaker left the title. And I am a fan overall of Waid and Soule’s runs. It is nice to see you excited and enthusiastic about Daredevil again Christine! I also really enjoyed the issue and the ground work it is laying with Fisk and the new NYPD Detective. And oh the beautiful art! I too am interested in in your take on the back up story, and their take on the radar. Although I am very glad that the visual representation of the radar is back to being more in line with the Rivera/Samnee version, which is my favorite take on the radar. Also, I half expected a picture of the issue next to food Christine. I thought that was a tradition with new number 1’s lol. Honestly? Best Daredevil issue since the hallowed days of Ed Brubaker and Michael Lark. And that talk the priest gives young Matt was phenomenal. I want to belong to that church and have my kids experience that empathic, wise ministry.